Wednesday December 2 1908 Ann came with me to the station where I left for home at 9.15. I had a nice trip home Will was not at the depot so I came out on the car at 4.50. I put my things away got our suppers and tatted all evening. 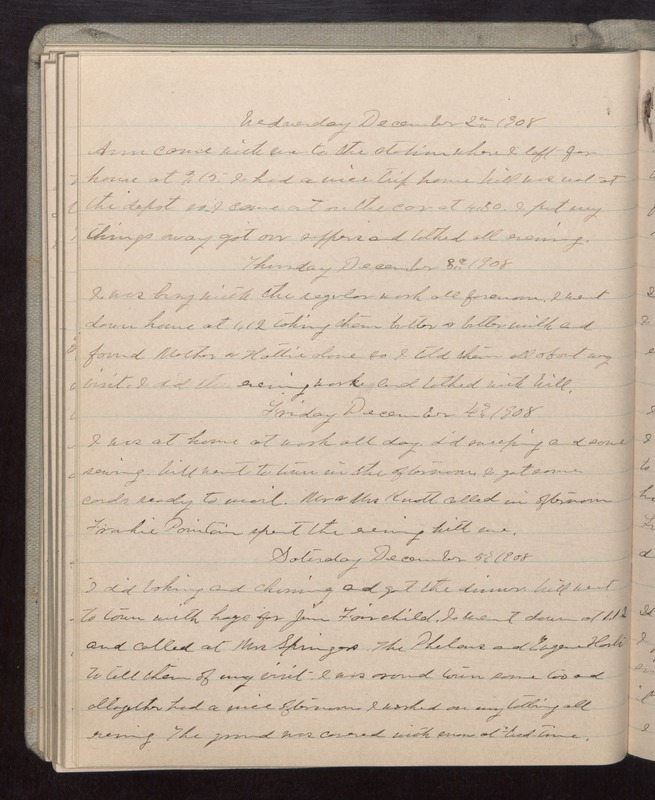 Thursday December 3 1908 I was busy with the regular work all forenoon. I went down home at 1.12 taking them butter & butter milk and found Mother & Hattie alone so I told them all about my visit. I did the evening work and talked with Will. Friday December 4 1908 I was at home at work all day. did sweeping and some sewing Will went to town with hogs for Jim Fairchild. I went down at 1.12 and called at Mrs Springers. The Phelans and Eugene [illegible] to tell them of my visit. I was around town some too and altogether had a nice afternoon I worked on my tatting all evening. THe ground was covered with snow at bed-time.